The Furniture Classics 40-54 Natural Salazar Island is available in Hickory Park's, North Carolina Furniture Galleries. Hickory Park may be restricted from showing prices, however please select the Click For Quote button and Hickory Park Sales and Design Staff will reply or please call (828) 322-4440 for more information. 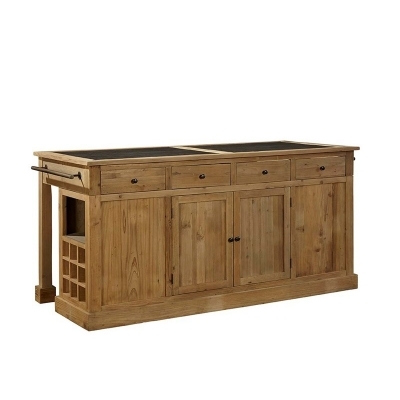 Well suited to entertaining, and perfect for meal prep, this handsome recycled pine island has a blue stone top and antique brass towel bars Each end features wine storage and a cubby perfect for cookbooks or small appliances. One side is perfect for tucking bar stools under and the other side features four drawers and storage with a removable shelf behind the pair of doors. Click here to receive price quote for Salazar Island 40-54 item.